John Henry of Luxembourg (Czech : Jan Jindřich, German : Johann Heinrich; 12 February 1322 – 12 November 1375),  a member of the House of Luxembourg, was Count of Tyrol from 1335 to 1341 and Margrave of Moravia from 1349 until his death. Henry was born at Mělník, the third surviving son of King John of Bohemia (1296–1346) and his consort, the Přemyslid princess Elizabeth (1292–1330). 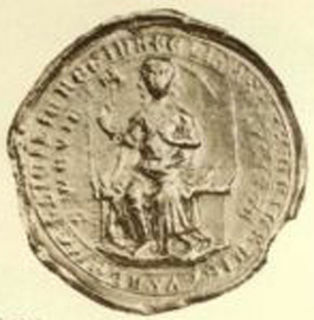 John Henry therefore was the younger brother of Emperor Charles IV. At the time of his birth, the marriage of his parents was already broken; his mother fled to the Bavarian court of the Wittelsbach duke Henry XIV, the husband of her daughter Margaret, and John Henry was raised in Cham, Upper Palatinate. Mělník is a town in the Central Bohemian Region of the Czech Republic. It lies at the confluence of the Labe and Vltava rivers, approximately 35 km (22 mi) north of Prague. The town is part of the Prague larger urban zone. The region belongs to the most important agricultural areas of the Czech Republic. The main agricultural produce are fruits, vegetables, potatoes, corn, sugar beet and wine. John of Bohemia was the Count of Luxembourg from 1313 and King of Bohemia from 1310 and titular King of Poland. He was the eldest son of the Holy Roman Emperor Henry VII and his wife Margaret of Brabant. He is well known for having died while fighting in the Battle of Crécy at age 50, after having been blind for a decade. During the rise of the Wittelsbach emperor Louis IV, King John had made attempts to reconcile with his former rival Henry of Gorizia-Tyrol, Duke of Carinthia and Count of Tyrol, whom he had deposed as Bohemian king in 1310. 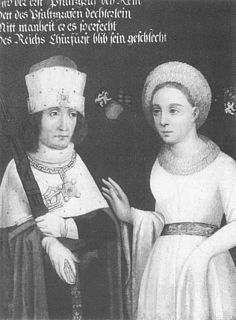 In 1327, his younger son John Henry and Henry's daughter, Countess Margaret of Tyrol (Margarethe Maultasch), were betrothed. 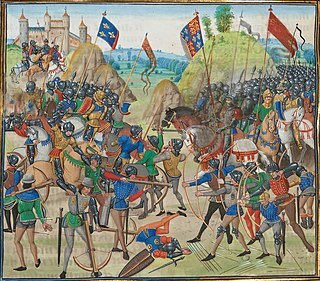 As Henry had no male heirs, King John expected a considerable enlargement of the Luxembourg lands and control over the Tyrolean mountain passes to Italy. John Henry and Margaret were married on 16 September 1330 at Innsbruck. Nevertheless, Emperor Louis IV in the same year secretly promised the Carinthian duchy including the March of Carniola and large parts of Tyrol to the Habsburg dukes Albert II and Otto of Austria. The Duchy of Carinthia was a duchy located in southern Austria and parts of northern Slovenia. It was separated from the Duchy of Bavaria in 976, and was the first newly created Imperial State after the original German stem duchies. Margaret, nicknamed Margarete Maultasch, was the last Countess of Tyrol from the House of Gorizia (Meinhardiner). Upon her death, Tyrol became united with the Austrian hereditary lands of the Habsburg dynasty. Thus, after Henry of Gorizia-Tyrol had died on 2 April 1335, Emperor Louis IV gave Carinthia and southern Tyrol including the overlordship of the Trent and Brixen bishoprics to the Austrian dukes, who themselves could refer to their mother Elisabeth of Gorizia-Tyrol, sister of deceased Henry. King John the Blind felt deprived, he put an end to his quarrels with the Polish king Casimir III and campaigned the Austrian duchy. A peace was concluded at the city of Enns on 9 October 1336, when John the Blind renounced Carinthia, while Margaret and John Henry could inherit the Tyrolean estates. The Prince-Bishopric of Trent or Bishopric of Trent for short is a former ecclesiastical principality roughly corresponding to the present-day Northern Italian autonomous province of Trentino. It was created in 1027 and existed until 1802, when it was secularised and absorbed into the County of Tyrol held by the House of Habsburg. Trent was a Hochstift, an Imperial State under the authority of a prince-bishop at Trento. The Prince-Bishopric of Brixen is a former ecclesiastical state of the Holy Roman Empire in the present-day Italian province of South Tyrol. It should not be confused with the larger Catholic diocese, over which the prince-bishops exercised only the ecclesiastical authority of an ordinary bishop. The bishopric in the Eisack/Isarco valley was established in the 6th century and gradually received more secular powers. It gained imperial immediacy in 1027 and remained an Imperial Estate until 1803, when it was secularised to Tyrol. The diocese however existed until 1964, and is now part of the Diocese of Bolzano-Brixen. Casimir III the Great reigned as the King of Poland from 1333 to 1370. He was the third son of King Władysław I and Duchess Jadwiga of Kalisz, and the last Polish king from the Piast dynasty. 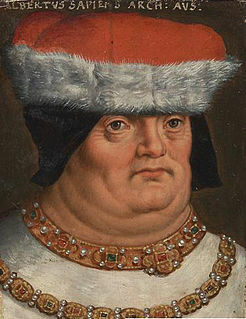 Charles IV acted as regent for his 14-year-old brother John Henry and soon came into conflict with the Tyrolian nobility. Furthermore, John Henry and his –reportedly– ugly wife had developed a strong aversion to each other. Margaret finally took the lead of the insurgence against her husband, when she refused him the access to Castle Tyrol on 1 November 1341. John Henry fled to the Patriarchal State of Aquileia, while his wife claimed that their marriage had never been consummated. Margaret was backed by Emperor Louis IV, who himself had plans to assure the Tyrolian heritage for the House of Wittelsbach. He had the scholars Marsilius of Padua and William of Ockham rendered an opinion that the marriage was not vaild. In 1342, Margaret took her inheritance of Tirol to her next husband, the Emperor's eldest son Margrave Louis of Brandenburg. The Patria del Friuli was the territory under the temporal rule of the Patriarch of Aquileia and one of the ecclesiastical states of the Holy Roman Empire. In 1420, the Republic of Venice acquired it, but it continued to be ruled for some time under its own laws and customs. Marsilius of Padua was an Italian scholar, trained in medicine, who practiced a variety of professions. He was also an important 14th-century political figure. His political treatise Defensor pacis, an attempt to refute papalist claims to a "plenitude of power" in affairs of both church and state, is seen by some authorities as the most revolutionary political treatise written in the later Middle Ages. It is one of the first examples of a reasoned defense of caesaropapism in Western Europe. Humiliated, John Henry returned to Bohemia. Furious King John allied with Pope Clement VI, who banned both Louis and Margaret; nevertheless, the Luxembourg rule over Tyrol was terminated. 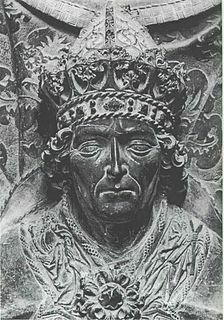 In 1346 the Bohemian king died in the Battle of Crécy and was succeeded by his eldest son Charles IV. Pope Clement VI, born Pierre Roger, was Pope from 7 May 1342 to his death in 1352. He was the fourth Avignon pope. Clement reigned during the first visitation of the Black Death (1348–1350), during which he granted remission of sins to all who died of the plague. After John Henry's marriage was conclusively divorced according to canon law in 1349, he married Margaret of Opava, daughter of Duke Nicholas II and Charles IV gave him the Bohemian Margraviate of Moravia as appanage. In turn, John henry had to renaounce all rights to the Bohemian throne. His second marriage produced several sons, none of whom however was able to leave surviving children, so John Henry's line ended in 1411. The eldest was Margrave Jobst of Moravia, the Elector of Brandenburg from 1388 on, who in 1410 became elected King of the Romans, but remained actually a rival king. After Margaret of Opava had died in 1363, John Henry married Margaret of Austria, the daughter of Duke Albert II and widow of Margaret Maultasch's son from her marriage with Louis of Wittelsbach, Count Meinhard III of Tyrol. He is buried at St Thomas's Abbey, in Brno. Henry of Carinthia, a member of the House of Gorizia (Meinhardiner), was Duke of Carinthia and Margrave of Carniola as well as Count of Tyrol from 1295 until his death. He became King of Bohemia, Margrave of Moravia and titular King of Poland in 1306 and again from 1307 until 1310. Frederick the Handsome or the Fair, from the House of Habsburg, was Duke of Austria and Styria from 1308 as Frederick I as well as King of Germany from 1314 as Frederick III until his death. Albert II, known as the Wise or the Lame, a member of the House of Habsburg, was Duke of Austria and Styria from 1330, as well as Duke of Carinthia from 1335 until his death. Otto , the Merry, a member of the House of Habsburg, was Duke of Austria and Styria from 1330, as well as Duke of Carinthia from 1335 until his death. He ruled jointly with his elder brother Duke Albert II. Meinhard II, a member of the House of Gorizia (Meinhardiner), ruled the County of Gorizia and the County of Tyrol together with his younger brother Albert from 1258, until in 1271 they divided their heritage and Meinhard became sole ruler of Tyrol. In 1286 he was enfeoffed with the Duchy of Carinthia and the adjacent March of Carniola. Meinhard III, a member of the House of Wittelsbach, was Duke of Upper Bavaria and Count of Tyrol from 1361 until his death. He was the son of Duke Louis V of Bavaria with Countess Margaret of Tyrol and as such also the last descendant of the Tyrolean branch of the House of Gorizia. 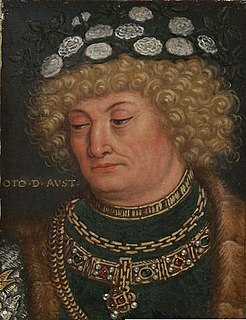 Rudolf I of Bavaria, called "the Stammerer", a member of the Wittelsbach dynasty, was Duke of Bavaria and Count Palatine of the Rhine from 1294 until 1317. Louis V, called the Brandenburger, a member of the House of Wittelsbach, ruled as Margrave of Brandenburg from 1323 to 1351 and as Duke of Bavaria from 1347 until his death. From 1342 he also was co-ruling Count of Tyrol by his marriage with the Meinhardiner countess Margaret. John of Viktring was a late medieval chronicler and political advisor to Duke Henry of Carinthia. The Duchy of Austria was a medieval principality of the Holy Roman Empire, established in 1156 by the Privilegium Minus, when the Margraviate of Austria (Ostarrîchi) was detached from Bavaria and elevated to a duchy in its own right. After the ruling dukes of the House of Babenberg became extinct in male line, there was as much as three decades of rivalry on inheritance and rulership, until the German king Rudolf I took over the dominion as the first monarch of the Habsburg dynasty in 1276. Thereafter, Austria became the patrimony and ancestral homeland of the dynasty and the nucleus of the Habsburg Monarchy. In 1453, the archducal title of the Austrian rulers, invented by Duke Rudolf IV in the forged Privilegium Maius of 1359, was officially acknowledged by the Habsburg emperor Frederick III. The (Princely) County of Tyrol was an estate of the Holy Roman Empire established about 1140. Originally a jurisdiction under the sovereignty of the Counts of Tyrol, it was inherited by the Counts of Gorizia in 1253 and finally fell to the Austrian House of Habsburg in 1363. In 1804 the Princely County of Tyrol, unified with the secularised Prince-Bishoprics of Trent and Brixen, became a crown land of the Austrian Empire in 1804 and from 1867 a Cisleithanian crown land of Austria-Hungary. The Counts of Gorizia, or Meinhardiner, were a comital dynasty in the Holy Roman Empire, originally officials in the Patriarchate of Aquileia, who ruled the County of Gorizia (Görz) from the early 12th century until the year 1500, when their territories were inherited by the Habsburg ruler Maximilian I. The Marchof Carniola was a southeastern state of the Holy Roman Empire in the High Middle Ages, the predecessor of the Duchy of Carniola. It corresponded roughly to the central Carniolan region of present-day Slovenia. At the time of its creation, the march served as a frontier defense against the Kingdoms of Hungary and Croatia. Margaret of Bohemia (1313–1341) was the daughter of King John of Bohemia by his first wife Elisabeth of Bohemia (1292–1330). Wikimedia Commons has media related to John Henry, Margrave of Moravia .